The channel - based in Doha - said it was "stunned" by the Palestinian Authority's decision. But the BBC's Arab Affairs Analyst, Magdi Abdlehadi, says the controversy surrounding al-Jazeera's broadcast reveals more about the crisis within Mr Abbas's group than about the satellite channel's often rocky relationship with Arab states. 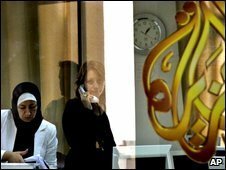 The al-Jazeera bureau chief in Ramallah, Walid al-Omary, said the station firmly rejected the accusations of bias. "We regret this decision, which harms the freedom of expression and the press in this country," Mr Omary said. In the Ramallah office, al-Jazeera employees were seen removing equipment before Palestinian security officials arrived to close it, Associated Press reported. The BBC's Katya Adler, in Jerusalem, says relations between al-Jazeera and the Palestinian Authority - dominated by political party Fatah - soured some time ago. In a statement announcing the decision, the information ministry said the station's coverage was "unbalanced". "Despite our repeated calls to remain neutral when it covers the Palestinian issue and to be balanced when it comes to the internal Palestinian situation, the channel continues to incite against the PLO and the PA," the statement said. It said it was taking the satellite channel to court and its operations would be suspended while this process was under way. In a letter to the channel it said al-Jazeera had broadcast "false news" on Tuesday night. The accusation appeared to relate to a programme in which Farouk Kaddoumi - one of Fatah's founding members - alleged that Mr Abbas had collaborated with Israel to kill Mr Arafat. Mr Kaddoumi has released what he says were the minutes of a meeting between former Israeli Prime Minister Ariel Sharon and Mr Abbas as evidence. Other Fatah officials have denounced the document as a forgery, saying Mr Kaddoumi's behaviour was an attempt to split Fatah, the oldest political organisation among the Palestinians which was, until the emergence of Hamas, the dominant force.